The Ruffwear Urban Sprawl is a plush dog bed that is perfect for winding down after any dog's long day out and about. This unique two-sided mattress gives you the option of using either the soft or firm sleeping surface. The removable faux suede cover is easy to clean. Both cover and mattress can be washed, separately. 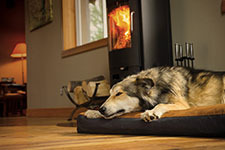 Durable microsuede provides a soft sleeping surface and will stand up to years of nesting, digging and whatever else your dog can throw at it. 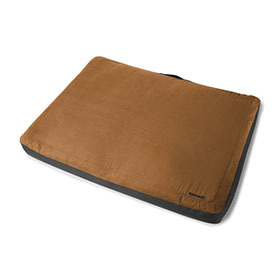 The waterproof, non-skid bottom creates a moisture barrier, keeping the bed stable on slick surfaces. The Urban Sprawl is equally at home in the living room, traveling or camping.